Celebrating some extra cash – NSW Rural Fire Services Superintendent Michael Brooks, left, Administration Officer Tracey Rigby, Moree RFS brigade volunteers Darryl Brady, Moree RFS Operations Manager Aaron Powell, Damien Lees, Captain Rhonda Gallagher, Senior Deputy Captain Robert Gallagher, Chloe Gallagher and Northern Tablelands MP Adam Marshall. 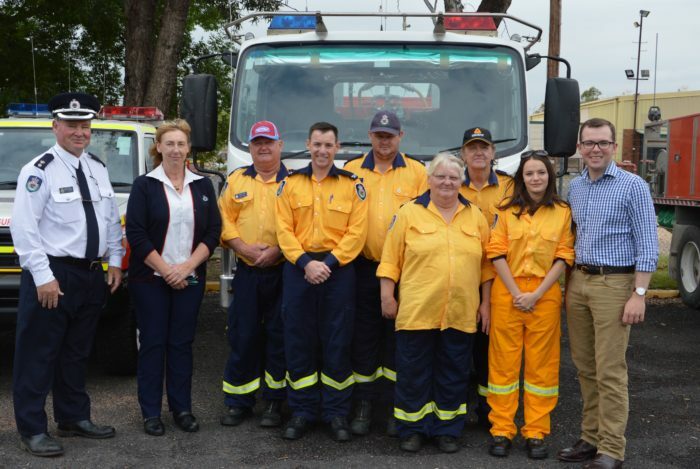 NEW state-of-the-art equipment and upgraded facilities are on their way to the Moree NSW Rural Fire Service Brigade following a visit from Northern Tablelands MP Adam Marshall last week. Mr Marshall met with volunteers from the Namoi/Gwydir team at the headquarters for the Moree brigade to present them with new funding from the NSW Government. The $4,000 grant enables the team to upgrade their fire fighting capability with a new specialist firefighting hose nozzle and also update some of the amenities at the depot including electronic equipment to help with training. Mr Marshall also congratulated members on their steadfast commitment and professionalism and said the discretionary grant funding would further enhance their capabilities. “It is a pleasure and an honour to be able to provide this additional funding for the Moree Rural Fire Service brigade,” Mr Marshall said. “All the fire fighters are volunteers and the Moree brigade has 26 at the moment, ranging in age from 16 to 60. Moree is part of the Namoi/Gwydir RFS region and according to team manager Superintendent Michael Brooks, the local brigade is active and busy. He said the new nozzle would give better volume control and help the volunteers in any fireground. The fridge/freezer replaces one that was 20 years old and a new smart television with computer link capability would assist with their training packages presentations. Superintendent Brooks said the RFS brigade assisted at many Fire and Rescue incidents in town and was responsible for all fires outside major towns excluding Hazmat events and generally looked after fire incidents in villages or in areas where there was no reticulated water supplies.